Your Brandeis Username and Password. A physical device you control such as a mobile phone, tablet, or landline phone to verify or authenticate your account. Note: It is recommended you set up 2 devices (you can remember your device for 30 days). Data plan is not required to receive mobile push notification or passcode via Duo Mobile app. Hardware Token Passcode A "keychain" hardware token displays six-digit code at a push of a button Tokens are available from the Technology Help Desk. What is Duo two-factor authentication? Duo protects your Brandeis account from being easily compromised due to phishing or malware by providing an extra layer of security beyond your username and password. Duo requires a second factor by validating something you have, such as a smartphone or tablet. Once you have enrolled, you will be required to use two forms of authentication to verify your identity when logging into Brandeis services: your username and password, and a physical device (such as mobile phone or tablet). What systems and services require Duo for login? Starting April 2019, Duo two-factor authentication will be required to access Workday. What if I don't have a smartphone or a data plan? It is not necessary to have a smartphone to use Duo. Also, a data plan is not required for your device. You can use a not-so-smartphone, tablet or landline phone as your second device. Alternatively, you can request a hardware token which does not require an internet or cellular connection. Tokens are available from the Technology Help Desk. Please refer to the Two-Step Authentication Devices table above for detailed information. How do I register a smartphone for Duo two-factor authentication? See the Setting Up Duo Instructions on the Brandeis ITS website to watch a video on the enrollment process or view a detailed step-by-step guide. Visit the Brandeis Duo Enrollment page to get started. How do I set Duo to prompt me for two-factor authentication only once every 30 days? Once you are in the Duo Authentication page, click the check box at the bottom that reads Remember me for 30 days. After you have fully authenticated, your browser will not require you to do this again when you come back at a later session (within the 30 day period). Note: Two-step authentication is requested at least every 30 days for each computer and each browser you use to access Brandeis protected websites. My computer won't let me click "Remember me for 30 days" - now what? If you are unable to select the 'Remember me for 30 days' checkbox and are prompted with a "You need to enable cookies in order to remember this device" message, you likely have the cookie settings pictured below*. 1. In the 'Accept third-party cookies and site data' section, select 'Always' from the drop-down menu. * Note: screenshot is taken from Firefox. Other browsers, such as Chrome and Safari will have their settings displayed differently. Or, if you want to keep third-party cookies blocked, enable an exception for the Duo cookies via this Duo FAQ "Can Duo's Remembered Devices feature work if third-party cookies are blocked?" I forgot my two-factor authentication device and don't have access to a backup device. 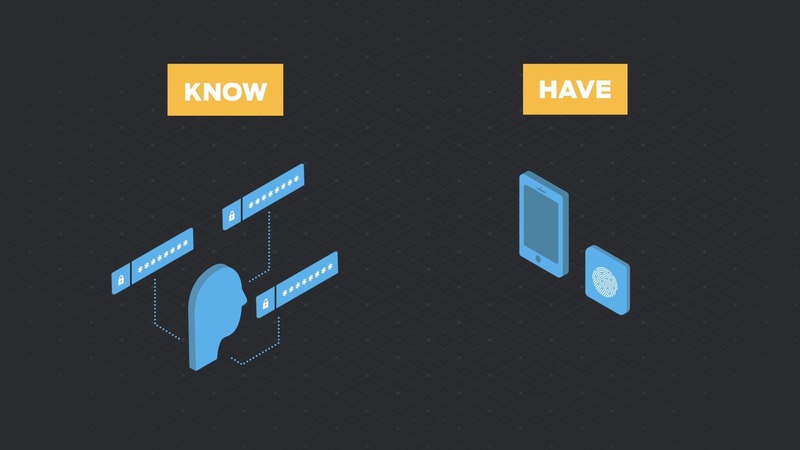 How can I use two-step authentication? Contact the Technology Help Desk for a one-time use passcode. The Technology Help Desk will have to verify your identity. What if I'm traveling with limited or no cellular or internet connection. How do I access my account? Obtain a hardware token from the Technology Help Desk before traveling. Have Duo send a list of 10 passcodes to your phone before you leave. 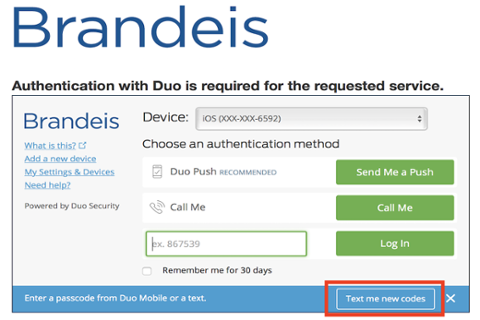 On the Duo Authentication screen, select 'Enter a Passcode' then click 'Text me new codes'. A list of 10 passcodes will be sent to the phone number provided. Note: these passcodes codes are for one-time use. Enter one of the 10 codes in the field next to the 'Log In' button, then click 'Log In'. How do I get a hardware token? A hardware token is a two-step authentication device that generates and displays a six-digit passcode at the push of a button. The device does not need wireless access or a data connection. Tokens are available upon request. Contact the Technology Help Desk to request a hardware token. It will need to be activated by a Technology Help Desk staff member before leaving the Help Desk area. What if I lose my hardware token? Contact the Technology Help Desk ASAP. We will replace it for you, and can assist with deactivating the lost one. What do I do if my hardware token stops working? Please call or come to the Technology Help Desk as the token will need to be reset by a staff member. What should I do if I have a new phone or new phone number? Contact the Technology Help Desk to deactivate your old phone number/device and register a new one for Duo. I use another two-factor authentication app like Google Authenticator, LastPass Authenticator, or Google 2-Step, how does this affect me? Duo is not currently compatible with Google Authenticator or LastPass Authenticator. 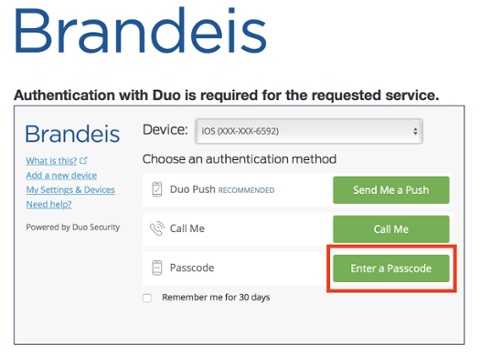 If you have Google 2-Step enabled on your Brandeis account, Duo is intended as a replacement. You may use both; you will be prompted twice for a second authentication factor (by Duo and Google). What if I already use Duo for another employer? If you use the Duo mobile app, you can still register your smartphone as your second factor. The Duo mobile app will create a Brandeis profile alongside your existing profile. If you currently use a hardware token, you will need to obtain a second hardware token from the Technology Help Desk.